Well, it’s happened. U.S. mall owner General Growth Properties filed for Chapter 11 bankruptcy today. General Growth Properties Inc, the second-largest U.S. mall owner, declared bankruptcy on Thursday in the biggest real estate failure in U.S. history. Ending months of speculation, General Growth, along with 158 of its 200-plus U.S. malls, filed Chapter 11 while it tries to refinance its debts. But the ongoing global financial crisis made it impossible for General Growth to restructure outside of bankruptcy and could signal further troubles for other financial institutions who are General Growth creditors. The collapse underscores the pressure on U.S. commercial real estate with few sources of available funding. Bankruptcy experts, however, say that many of the worries may be unfounded. The sector may not have been tested by a big bankruptcy yet, but enough is known about how the companies are structured and how a bankruptcy proceeds that experts think the industry should emerge fine, even from a series of bankruptcies. Further, there is reason to believe that because REITs control a tangible base of assets through large portfolios of real estate, these firms may be more likely to survive bankruptcies than other companies that’s value is harder to pin down or could be subject to liquidation. They should sell the worst malls, including the beleagured Northwest Plaza…though I’m almost certain NW Plaza will facing the wrecking ball. @Jonah: They may do that, but keep in mind that the “worst” malls are also going to be more difficult to sell and would go for a lower price point. The point is raising capital, not unloading a ton of property. Plus we don’t know what the balance sheets are like for some of these malls–sometimes old, half-empty centers make the landlords more money than a debt-saddled, top-notch newer mall. Right…so they could shave the fat from both ends. Sell some nice malls, sell some dumpy ones. I think it would be not an unreasonable idea for GGP to sell their five Houston properties (Baybrook, Willowbrook, Deerbrook, First Colony, The Woodlands) to Westfield. It would certainly create a way to distinguish between the OTHER Willowbrook and the OTHER Deerbrook. They should sell the Fox River Mall in Appleton, WI to Simon, along with a few of GGP’s other malls in Wisconsin. I have to challenge that assessment. GGP is 70% leveraged debt vs Simon witch is only 40% if I recall correctly. Both companies have a lot of dead wood that needs to be disposed of. The big winners in all this are Macerich, Simon & Westfield. You watch them pick off one property after another. This is just speculation on my part but I wondered what others thaught. Go Macerich! Absorb GGP! Destroy Simon! Oh, and interestingly enough, Natick Collection isn’t filing. A good example of why GGP has problems….First, spending a TON of money trying to save declining Cumberland Mall: a mall that has a really nice facelift, shaved off TWO anchors (no replacements) and has a rather notable crime problem. Second: Century Plaza Mall…a mall on the brink of being padlocked that I’m sure has been a drag on the company. The mall fell very fast and hard, starting with the closure of Rich’s in 2004 then Belk/McRae’s and Penney’s bailing in 2006. That is a huge two story mall that I’m sure would hurt any company to have hanging on their balance sheets. Third, all of their other malls they dumped a LOAD of cash in the boom to upscale/renovate while competitor Simon didn’t hardly spend a dime on upgrades. I’d call it a stroke of bad luck, stupid trends and bad timing. Of these, Mayfair is the only mall they got through acquisition, and this was before their massive renovation / expansion in 2000 that was completed in 2001. The other two were opened in 1984 (Fox RIver), and 1986 (Oakwood), respectively. Simon should get Fox River and Oakwood. Fox River is too strong of a mall to just give off to some ‘no name’ conglomerate. My fear though with this move, would be that they’ll allocate more resources to Fox River Mall, leaving their two regional players in the NE Wisconsin market (Forest Mall, Fond Du Lac, and Bay Park Square, Ashwaubenon ) literally ignored. Not that much else can be done with both malls. Both are literally land-locked, and have no room to expand. However, both malls have strong anchors, and it would be a shame to see them wither away. Oakwood….if Simon nabbed this one, it would put them back in the Eau Claire market, and they’d be owning the largest mall in that entire half of the state, an area they bailed out of long ago after selling off their London Square Mall back in the 1980s. When Oakwood was built out, it took 90% of London Square’s national chain stores with it, sealing that mall’s fate….a rapid death spiral. Mayfair, is the tough one for me to figure out. That’s Wisconsin’s ‘creme-de-la-creme’ of shopping centers. Not only that, it has four office towers on the property, so it’s more of a ‘mixed use’ deal. Who would be most likely to pull that mall out from under GGP’s feet? Then again, maybe that should be the one GGP keeps in their portfolio. They know it’s a winner for them. In the bombed-out world of commercial real estate, Bill Ackman has placed himself at ground zero. The activist investor — whose hedge fund Pershing Square Capital Management amassed a 25 percent stake in General Growth Properties — yesterday watched the Chicago-based shopping-mall giant go bankrupt. In an unusual move, Ackman in recent weeks had actually lobbied for the Chapter 11 filing. His risky bet: that the market value of General Growth’s malls exceeds its staggering $27 billion debt load, creating a huge upside to the mountain of shares he bought on the cheap. “It’s an educated gamble,” said Erik Kaiser of REMI Cos., a New York real-estate consulting firm, noting that “there are a lot of eyes” among real-estate investors looking to bid for General Growth’s assets. Among more than 200 malls nationwide, General Growth owns the South Street Seaport and Staten Island Mall. Still, “it could be a gamble gone wrong,” Kaiser added, noting that Ackman is subject to the whims of a courtroom, creditors and a devastated real-estate market. Indeed, many on Wall Street are predicting that commercial real estate is primed to suffer some pain in the coming months as the effects of massive job cuts lead companies to cut back on office space. And General Growth is especially vulnerable given it’s in the mall business, which has taken it on the chin as consumers pull back on spending in a swooning economy. To bolster his chances, Ackman has seized a central role for himself in the effort to restructure General Growth by supplying $375 million in debtor-in-possession financing. As soon as the DIP loan is approved by a bankruptcy judge, Ackman is expected to take a seat on General Growth’s board. According to the terms of the DIP agreement, Ackman will acquire warrants for stock when the company is eventually reorganized, according to sources close to the situation. Nevertheless, sources said Ackman hasn’t yet come forward with a plan for reorganizing the company. Whatever his ideas, Ackman has stumbled badly of late elsewhere. A flopped campaign to force “cheap chic” retailer Target to sell the land under its stores resulted this spring in a devastating loss of 90 percent for shareholders in a special, Target-based fund at Pershing Square. Analysts have pooh-poohed his Target plan, but Ackman this spring is agitating to replace five board members in a bid to make it happen anyway. While many experts expect General Growth to survive its restructuring mostly intact, the process could take several years, as a slumping economy continues to pressure consumer spending. General Growth will likely be forced to sell several malls, potentially weakening its competitive position and pushing down market values. Meanwhile, the company’s plan to sell the South Street Seaport, Boston’s Faneuil Hall and Baltimore’s Harborplace remains on track, said Daniel McNulty, co-chairman and co-CEO of DTZ Rockwood, the outfit hired to sell the three waterside properties. Here at Neshaminy (which is NOT filing unfortunately) we have some of the strictest (or is it most strict?) mall cops around. I noticed that the other Philly area-GGP property, Christiana Mall, lets only those over 18 into the mall by themselves after a certain hour. Is GGP strict all around on policing mall patrons, or is this a coincidence? Would anything change if the mall was sold off? Ryan–based on my limited experience, it seems as though GGP’s policy enforcement is done on a mall-by-mall basis. For example, the Fox River Mall (Appleton, WI) has historically been relatively crime-free and I’ve never noticed any extremely strict policy enforcement. By comparison, Mayfair Mall (Milwaukee) was starting to experience some major problems with crime and they instituted a parental guidance policy on Friday and Saturday’s after 3 p.m. that sounds similar to what they’re doing at Christiana Mall. It would be interesting to hear what they do at other malls around the country, though. 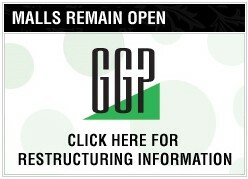 I think GGP is a ‘mall-by-mall’ basis….depends on if the mall has past troubles with unruly18-under patrons or not. For example, with their three WI properties, only one, Mayfair, has a ‘curfew’ policy in place. The other two malls haven’t had nearly as many problems as Mayfair has with young patrons who don’t follow the rules. Most malls DO have plaques / posters up on the wall, usually near every entryway, that states the mall’s code of conduct. People though, especially younger ones, refuse to pay them any heed in some cases. Most of the rules are just plain old common sense though. It’s not the mall (owners or management) faults that they have to set up these ‘curfews’. It drives me nuts when I read complaints towards management from parents and their kids who DO behave themselves at their favorite mall. The blame should be towards those few who ruin it for those who do follow rules. While GGP handles curfews on a mall-by-mall basis, one REIT in my opinion that seems notorious for curfews is the Pyramid Companies, which has a curfew for about half the malls they own. The only company that I’m aware of that doesn’t do with the curfew thing is Simon, although when it owned Mall of America, it enacted one back in the mid 1990s. The Mall of America is understandable, as it’s a tourst-y mall, not a ‘hangout’ mall. It’s a stereotype, unfortunately, but young patrons (the bad ones, not those who behave) only done it to themselves to deserve the stereotype. That being, if they’re just ‘hanging out’ and goofing around, it makes it seem like they’re troublemakers. Something that many who pass by, they get nervous. Another mall is Easton Town Center Columbus OH. There justification is that after 9:30pm venues such as comedy clubs transforms the center from a family oriented property to an adult oriented one. If you are 16 or under & you are not an employee of one of the retailers, you must be escorted by someone over 21 otherwise you are asked to leave. Trouble makers can be band from the property for a year at a time if caught tresspassing. Employed youth are almost exempt from this polisy. Another problem with rowdy teens is the lack of things for them to do while they are in the mall. Management should realize that many teens (and some adults) come to the mall to socialize and have a good time. I think it would help if malls would host events specifically for teens. Anything from dance bashes to Guitar Hero tournaments would work. Another idea would be for the management (moreso marketing) to work with the local school districts and get the word out about these events and to remind teens that the mall is a wonderful place to shop, dine and socialize, but to be considerate to others when they step into the marketplace. Looks like all the malls in Michigan except Grand Traverse and Crossroads are in the filngs. Interesting. Really, I think mall owners and management have absolutely no problem with teens hanging out at their properties…socializing, shopping, grabbing a quick meal, catching the latest movie. So long as one doesn’t go there to just cause trouble and harass other patrons they don’t know, or causing a nuisance or safety hazard to others, it’s all good. Trouble is, like with a lot of things in life, it only takes a few bad apples to ruin it for everyone else who plays by the rules. Going to the mall is a privilege, not a right, and since it IS privately-owned property, the owners / management work together to set the rules. Most of which are just plain common sense when out in public. Common sense, is something that is lacking with some young people these days. General Growth Properties, the giant shopping mall company whose holdings stretch from Tysons Corner to the planned community of Columbia and Baltimore’s Inner Harbor, yesterday sought protection in bankruptcy court, citing debts of more than $27 billion. The bankruptcy heralds a wave of trouble in commercial real estate that threatens to put another damper on the economy, industry analysts said. By the end of 2011, $1.2 trillion of commercial real estate debt will come due, and like General Growth, many of the borrowers will be unable to refinance or repay their loans, said Gregory H. Leisch, chief executive of Delta Associates, which tracks the industry. That would spell more losses for banks and institutional investors such as life insurance companies that are already coping with the meltdown in residential real estate. The bankruptcy adds a new element of uncertainty to the future development of Columbia, where General Growth has been working on a long-term plan that county officials have been counting on to revitalize the downtown. The economic crisis already assured a delay for the first major effort to remake the 1960-era planned community in decades. But for people visiting General Growth’s malls, the Chapter 11 reorganization could be imperceptible. General Growth, the nation’s second-largest shopping mall owner, had struggled for months to win reprieves on billions of dollars of debt, much of which was past due. The company tried to sell some properties to raise money, but the same lack of credit that prevented it from replacing its loans kept prospective buyers from raising money. “What it tells you is that if they don’t get the financial system restarted, then every real estate company is going to go bankrupt,” said William Ackman, principal of the hedge fund Pershing Square Capital Management, which holds a major stake in General Growth. Other observers said General Growth left itself exceptionally vulnerable to the recession and credit crunch because it had mortgaged itself so heavily. “They’re the poster child for too much debt, and they have been for five years,” said analyst Richard Moore of RBC Capital Markets. The company, based in Chicago, owns or manages more than 200 malls in 44 states. Its interests include Harborplace and the Gallery in Baltimore, Boston’s Faneuil Hall Marketplace, New York’s South Street Seaport, the Fashion Show Mall in Las Vegas, Alexandria’s Landmark Mall as well as Laurel Commons and Tysons Galleria. General Growth’s problems can be traced partly to its debt-financed purchase in 2004 of Rouse, the pioneering developer of Columbia and of festival markets such as Harborplace. Asked what the bankruptcy means for Columbia, the company’s president said the time table for further development there is uncertain, but he said that was mainly a reflection of broader financial conditions. “The reality is that there is not much capital available today for new development,” Nolan said. In October, General Growth unveiled its long-anticipated plan for transforming downtown Columbia. The ambitious blueprint, three years in the making and now under review by the county’s planning board, called for the construction of 5,500 new housing units and 640 hotel rooms along with retail and office space. Howard County officials hoped it would generate needed revenue and pump life into the community, home to 40 percent of the county’s residents. County Executive Ken Ulman (D) said a General Growth official called him early yesterday morning to discuss the filing and told him the company would continue to pursue the zoning changes. The recession has taken a toll on retailers, and vacancy rates have climbed sharply at strip shopping centers across the country. General Growth’s malls show signs of that weakening. For example, sales per square foot in the company’s malls were declining at an annual rate of 4.2 percent late last year, and the occupancy rate fell to 92.5 percent on Dec. 31 from 93.8 percent a year earlier, the company reported. Still, “virtually none of its problems are tied to the overall retail environment,” said Steven Marks, who analyzes real estate investment trusts for Fitch Ratings. One of the last straws for the company came days ago when a group of bondholders called for legal action to enforce payment of the bonds. General Growth said it has lined up $375 million to fund its operations while in bankruptcy. The financing is from Ackman’s Pershing Square, which has amassed a 25 percent stake in the company over past months, betting that the company was worth more than its depressed share price suggested. General Growth shares closed at $1.05 yesterday, far below its 52-week high of $44.23. The company’s bankruptcy filing listed assets of $29.6 billion and debts of $27.3 billion. During the bankruptcy, the company plans to pay interest on its mortgages but not on its bonds, Nolan said. That translates into continued pain for unsecured creditors. Major investors, directly or indirectly, include Fidelity’s FMR and fund manager Vanguard Group, according to the bankruptcy filing. The big losers in the company’s decline include its founding Bucksbaum family. As of March 23, chairman John Bucksbaum and other family interests held more than 2.6 million shares, according to a regulatory filing. Bucksbaum was replaced as chief executive in October. The company also replaced chief financial officer Bernard Freibaum, who had been struggling with debts of his own. Freibaum sold almost 3 million shares in October to repay margin calls — demands for repayment of borrowing — and he was left with $3.4 million of margin debt, the company reported in October. When Adam Metz, who had been the company’s lead director, was named interim chief executive last fall at a salary of $1.5 million, the company promised him a “fixed bonus” of $2 million and the potential to earn an additional bonus of $1 million based on performance. “While we have worked tirelessly in the past several months to address our maturing debts, the collapse of the credit markets has made it impossible for us to refinance maturing debt outside of Chapter 11,” Metz said in a news release. Separately, one of the nation’s top bankers yesterday predicted that the banking system will experience mounting losses from commercial real estate. “You’re going to see rapidly rising charge-offs,” J.P. Morgan Chase chief executive Jamie Dimon told analysts.